The Peak Tram will temporarily suspend service for Peak Tram Upgrade Project for around 2-3 months from Tuesday, 23 April 2019. 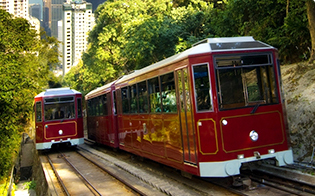 The venerable Peak Tram is, as most passengers agree, the only way to truly experience the beauty of Hong Kong's natural wonders. Tens of millions of people from every corner of the globe have taken the ride, which affords a uniquely spectacular perspective of the city. The Peak Tram is undergoing a substantial Upgrade of the Peak Tram system and stations, commenced in 2018 and is scheduled to complete in 2021. Perching on The Peak at 396 metres above sea level, The Peak Tower is one of the most stylish architectural icons in Hong Kong. 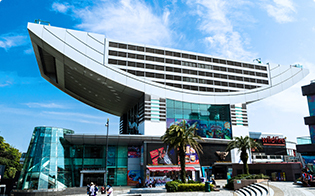 Inside The Peak Tower, there is a dazzling array of restaurants, shops and entertainment venues set against the beautiful backdrop of the city. 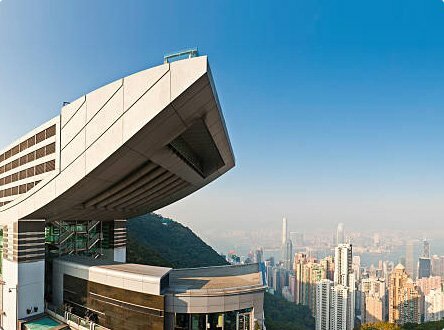 Sky Terrace 428, standing at 428 metres above sea level, is the highest viewing platform in Hong Kong offering a stunning 360-degree panoramic view across the Hong Kong. Whether you visit The Peak in the morning, afternoon or nighttime, Sky Terrace 428 is a scenic spot that you should not miss! It’s time for YOU to take the spotlight at Madame Tussauds Hong Kong. Famous faces - Kim Woo-bin, Kendall Jenner, Donald Trump and Benedict Cumberbatch – they’re all inside already, so come and make your appearance!! We’ve rolled out the red carpet and just can’t wait for you to join us!! EXPLORE HONG KONG AT THE PEAK OF HONG KONG! 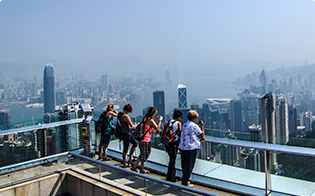 The "Hong Kong Sky Tour" is an interactive audio tour available in six languages. It takes you to explore Hong Kong's architecture, neighbourhoods, culture and history while you enjoy the spectacular views of Hong Kong Skyline. From 23 April until 7 July 2019, The Peak Tower launched a major marketing campaign, “Crazy Lucky Draw @ The Peak”, with a DAILY GRAND PRIZE of Samsung Galaxy S10 and total prize value over HK$1,000,000!